DMV.com was created to help simplify your life by providing you with all the vehicle related information and North Dakota DMV services you may need, in one place. Quickly find information and services regarding driving records, vehicle registration, drivers license renewal, license plate renewal, getting a learners permit, and finding a North Dakota Department of Motor Vehicles approved traffic school. Residents must obtain a North Dakota drivers license before they can drive legally. Learn about the DOT drivers license application process. Requesting North Dakota driving records online is the easiest way to access your DMV driving history. Order your DMV driving record today. Minimum auto insurance coverage is required by the DOT for all cars registered in North Dakota. Find low cost car insurance online today. Passing an insurance reduction course in ND leads to a reduced car insurance premium. Enroll in online traffic school to save on insurance. Take a DMV practice exam to test your readiness for the license exam. Passing a North Dakota DMV practice test helps you earn your license. Official North Dakota vehicle registration is required by the DOT. Learn about new car registration, car registration renewal and more. Some new drivers must pass ND drivers ed classes before they can obtain a license from the DOT. Learn about required drivers training in ND. Individuals buying or selling a car in North Dakota must fill out a bill of sale when applying for a car title transfer with the DMV in North Dakota. Failing to respond to traffic tickets in ND can lead to more penalties from the DOT. Learn how to pay a ticket online or dispute a ticket. Getting a DUI in North Dakota means fines, prison time and license suspensions. Learn more about DUI laws enforced by the DOT. Buy a used car or new car online to make your North Dakota car purchase easy. Buying a car online expedites car registration at the ND DMV. DMV locations are available throughout North Dakota. Get ND DMV contact information to obtain the DMV services that you require. Cut out MVD’s bureaucracy. DMV.com has easy guides for drivers license, vehicle registration, license plate, emissions and other motor vehicle issues online. 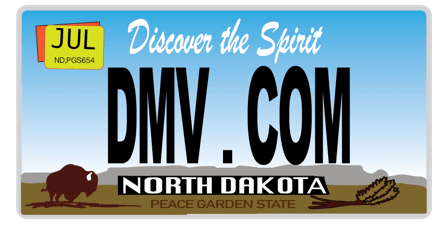 We are happy to present you DMV.com – your online guide to the North Dakota Motor Vehicle Devision. This is a privately owned website that has no relation to any government agency and gives you an easy access to all information you need about ND DMV with no trouble at all. Our major purpose is to give you an insight about any requirements that the North Dakota DMV has for different types of vehicles such as motorcycles, cars and boats. We offer you a wide range of articles on obtaining and renewing a driver’s license, choosing auto insurance and more. You’ll find no difficulties navigating our website. Use either the “search” feature or the navigation sections to find the info you need about North Dakota DMV. Read out step-by-step guide towards getting a driver’s license, obtaining or renewing the license and all other details you need. Our website contains a great deal of useful information but we are also open for collaboration – visit our Facebook page and give us your feedback that will contribute to making this site even better and more up-to-date.